Here is another recent find on visual management: the website of MediFilm “the leaders in healthcare visual management systems”. Who knew there was such a thing to be leaders of? 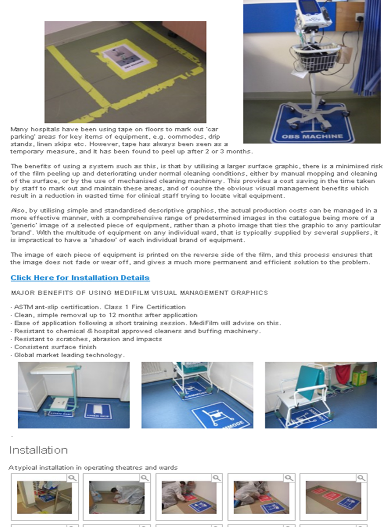 Well done in any case, making a product out of an specialty application of graphics which can be applied to the floors, targeting an emerging niche of lean hospitals. 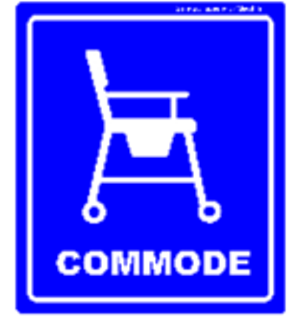 As all good visual controls should be, these are simple, direct and unambiguous: here is where you put your commode. 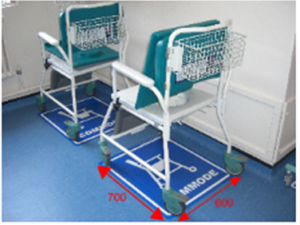 There are many examples and photos of visual management used to remove ambiguity and identify abnormalities on this website. They have obviously gone to great lengths to understand their customer and their need for good visual management in order to create these attractive and durable visual applications for the hospital floors. 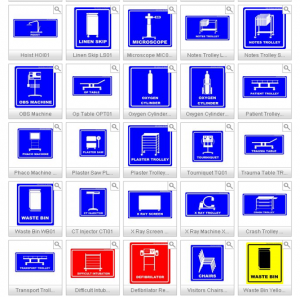 Many times during a 5S workplace makeover we see blank spaces or shadows of materials, tools or equipment that should be placed in a particular location. The next level includes the name or alphanumeric identifier of the item included in the space. Even better is a photograph of the actual item laminated and taped to the surface. The folks at MediFilm have taken the removal of ambiguity through visual management to yet another level of professionalism and customization, so kudos. I am looking forward to the reaction of blogger, friend, Lean Hospitals author and sometimes-opponent of the stringent application of 5S workplace organization principles – Mark Graban – to the solutions offered by MediFilm. 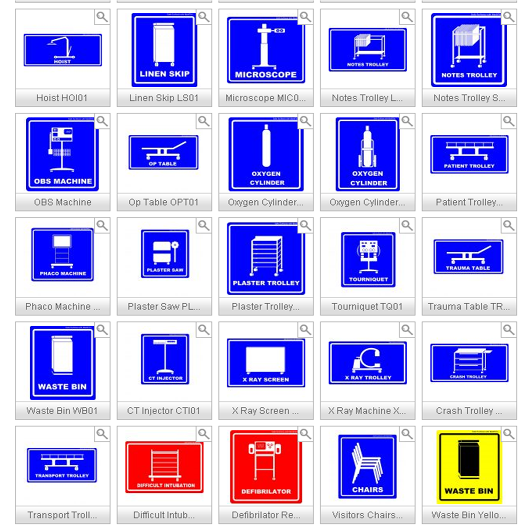 these would be good visio or powerpoint icons to do material and information flow in a health care setting. Good find, John. I’m forwarding that to a hospital client that’s struggled with the tape as well. We got a bit more creative and started marking on the wall what should be sitting in front of it, but that doesn’t always work perfectly either for their 5S organization. great product. used these guys in our Trust across all wards through the Productive Ward programme. Simple solution to a stubborn problem, we also struggled with tape. Best product on the market in my opinion, have done bespoke work for us also.